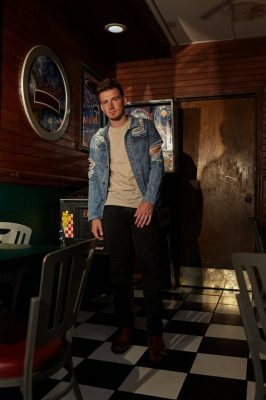 Big Loud Records exciting new talent MORGAN WALLEN is primed to turn Country radio upside down as his new single “Up Down,” featuring BMLG Records’ superstar duo Florida Georgia Line, is this week’s most added single with 80 first week stations on board. Quickly after its October release, the fun-loving track rocketed into Spotify’s U.S. (#4) and Global (#6) Viral 50 charts, hit the iTunes Country A-List, launched into the Top 10 on Sirius XM The Highway, and entered the Top 40 on the Billboard Hot Country Songs chart. Meanwhile, the song’s “infectious” (Rare Country) beachside music video has racked up more than 5 million views. “Up Down” follows Wallen’s Top 30 debut single, “The Way I Talk,” and gives a taste of his first full-length album, expected in 2018. The kinetic performer has been honing his skills on the road throughout the year, opening for FGL’s THE SMOOTH TOUR 2017 and labelmate Chris Lane’s TAKE BACK HOME TOUR. He’ll round out a fiery run as support on Granger Smith’s DON’T TREAD ON ME TOUR in Flint, MI on December 17. Born in Sneedville, Tenn. (also home to bluegrass legend Jimmy Martin), Wallen was a star on the baseball diamond, attended the same high school as Country superstar Kenny Chesney, and has deep roots in the church. With a Hard Rock-loving preacher for a father and a mother who couldn’t get enough Country and contemporary Christian music, Wallen began performing for his local congregation at the tender age of 3 and went on to develop a strong love of Country, Rock and Hip-Hop. After moving to Music City in 2015, he’s co-written with hitmakers like Craig Wiseman, Rodney Clawson, Chris Tompkins, the Warren Brothers, Tommy Cecil and Matt Dragstrem, and has been honing his studio poise with award-winning producer Joey Moi. Wallen’s five-song EP THE WAY I TALK (2016) features Top 30 debut single “The Way I Talk,” that made its mark on Spotify’s popular Wild Country, New Boots and New Music Friday playlists. Find the most current Morgan Wallen tour dates from our partners at Country Music On Tour, your trusted country concert ticket source! Country Music News Blog participates in advertising programs that help fund the operation of this site. For more information please visit our privacy statement. This entry was posted in Morgan Wallen, Press Releases, Videos by Shauna "WhiskeyChick" Castorena. Bookmark the permalink.